I had an up close and personal relationship with India over 40 years ago, when I backpacked around it for two months (during a war, no less! ), staying mostly in hostels and living on a dollar a day. I was interested to see the changes, yet fearful of the in your face impact I remember. 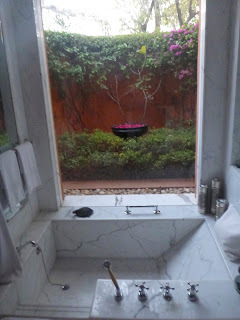 For this reason I chose a "Maharajah" tour, staying in hotels which are former maharajah's palaces. We left at 6 a.m. and saw dawn breaking as we drove an hour to the airport. After a two hour flight to Mumbai (formerly Bombay), we had lunch at a Marriott Courtyard Hotel. We could tell it was on the outskirts of town because there were a lot of motorcycle taxis around and they are not allowed in city center. We had a beautiful Indian buffet lunch before going back to the airport for the 1 12 hour flight to Jaipur. Our flight was delayed an hour but we finally got there and met our guide. He took us on a bus through Jaipur, stopping at a wood stamp store and a carpet store for demonstrations. There were about ten guys rolling out carpets for us to look at and they gave us tea and drinks. Nobody bought a carpet, which were priced at $250 to $2000. We later chided our guy for taking us to stores that would probably not appeal to college students, who generally have little money and no home of their own. He insisted he was not getting a kickback. I didn't really believe him, but I think he got the message. We got to our hotel, Raj Villas, about 7 p.m. I don't know if it was originally a palace since it seemed so new and well kept, but it was a fairy tale version of one. There was a main building with reception, dining, and shops. The guest rooms were scattered around the extensive grounds. There was a beautiful swimming pool and lots of sculpture and fountains. 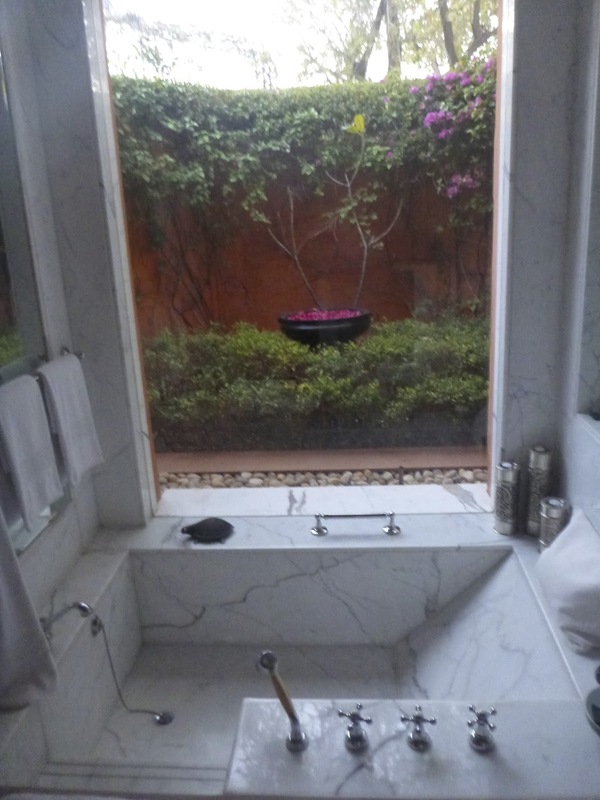 My room had a sunken tub looking out on a private garden. Dinner was an Indian menu, with a sitar player accompanying the meal. They had a lot of programs in the daytime, like yoga, chanting, spa treatments, etc., but we left at 7 a.m. The next day we rode elephants up to the Amber Fort and enjoyed it's stunning views. We rode elephants up to the top. We then went back to Jaipur to see the City Palace and Royal Observatory. It was a 4 hour drive to Laxmi Niwas Hotel, which really is an old Maharajah's Palace. The rooms are large but more lacking in "luxury items" like air conditioning. I had a hot shower and ceiling fans, though. Everything is whitewashed. We had a buffet dinner in the old throne room. Afterwards they treated us to an Indian dance show.